i got bored today and threw down this gnarly photoshop, in my opinion it should replace the gay bridges picture at the top of the page but adam will pretty much be over that i recon. 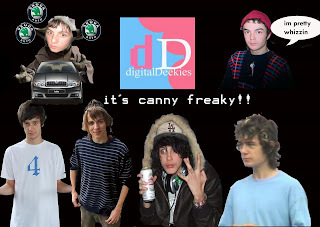 are you aware of digital deekies? could andy_c_skate comeback ever be possible? who do you miss most on the session? what was your favourite spot? what was the funniest moment you witnessed whilst on the session? was that where i couldnt get over the fence? what do you do these days now you dont skate? have you sold your soul to the devil and been taken in by the world of drugs yet? nahnah none of that stuff, are you still into the mdma? are you still the most unlucky person in the world? ....and to take you back to the days of the andy_c here is a weekly montage featuring him.